How much is community service worth to you? How about prison-like-wages of 35 cents per hour? That's the cost of giving five hours to community service in exchange for one free tall coffee from Starbucks ($1.75). Customers who fill out cards in Starbucks' stores pledging to volunteer five hours of time will receive one free tall coffee today through Sunday. It's part of Starbucks' plan to get in on Obama's inauguration good vibes. They've teamed up with the HandsOn Network in an effort to "raise pledges in excess of one million hours of service from all over the country." 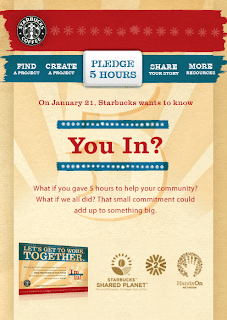 While I am not always a big fan of Starbucks initiatives I do like the HandsOn Network and let's face it-- if anyone in this country has the time and money to give to community service, it's people who can still afford Starbucks. A free tall coffee may seem stingy but the coffee is not the point. It's just a way to get people invested the way you use doughnuts to get people to come to boring but important meetings. There's even a special Web site called Pledge Five for people to track their hours and encourage their friends to volunteer.